Welcome to Kingsdown Golf Club. Founded in 1880, it is the second oldest Golf Club in the West of England (behind Westward Ho!) and the oldest Club in Wiltshire. Our downland course is renowned for its stunning scenery, beautiful fairways and superb greens. The excellent drainage makes play possible all year round. The Men’s White Tees, the course, a Par 72, measures 6,501 yards in length. For the Ladies, the Red Tees boast 5,744 yards and a Par 73.
the only two courses with higher rankings being proprietary clubs. See the rankings here . Would like to say a big thank you to everyone at Kingsdown Golf Club, we all had a most enjoyable day with you, we were made to feel most welcome from you all. The food was excellent, as was the golf course. NB: There is no subscription charge for a Junior Member if they have a parent/guardian or grandparent who is a Full member of the club. See our Membership page here for more details on what we offer. Visitors, from Wiltshire and beyond, are welcome to Kingsdown Golf Club throughout the week and can look forward to an excellent round of golf, followed by a warm, friendly atmosphere and some good food in the Clubhouse. Click here to book a tee time, here for Society Visits and here for our Open Events. Wiltshire took on Dorset on a chilly day here at Kingsdown..
We are part of Bristol Golf Breaks. If you are looking to play Kingsdown Golf Club as part of a "Stay and Play" package, click the here to be transported to the Bristol Golf Breaks website. We offer a range of membership types including Flexi Memberships where a low subscription is charged and then a reduced Green Fee is paid each time you play. See our Types of Membership page for more details. Why not book a lesson with one of our experienced Professional Staff? With our state-of-the-art Driving Range and Video Analysis of your swing, you'd be mad not to give it a go.. 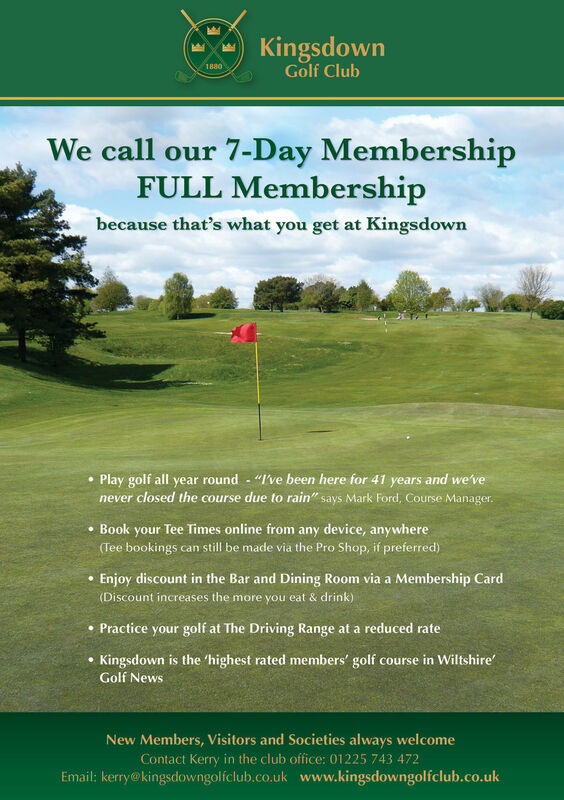 Located 12 miles from Junction 17 and 11 miles from Junction 18 of the M4, Kingsdown Golf Club is easy to get to. Check out our Club Video and 18-hole flyovers. Just a brief thank you for the excellent day we had at Kingsdown on Wednesday. We all thoroughly enjoyed ourselves, both on and off the course.